You are here: Home - Buying Stone - Systematic procedure on laying a patio using thin stone veneer. Systematic procedure on laying a patio using thin stone veneer. 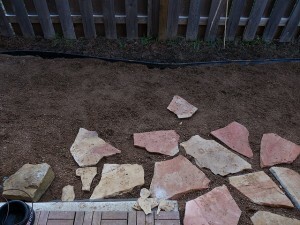 You will need a hammer, stiff brush, joint tool, masonry brush, selected stone, brick trowel, scraper, flat trowel, grout bag as well as sand and cement. Any masonry surface qualifies for the application of natural thin stone veneer. If you intend to apply it to painted surfaces, you must sandblast the paint or strip it out. Paint removal where the surface is from construction could prove hard at times. You can, however, remove it successfully as follows. Nail metal lath to wall securely, 6 inch on centre. (For exterior surfaces, vapour barrier first, then metal lath). Then, apply scratch coat (2:1 washed sand: Portland cement) to the lath. Make sure the lath gets covered entirely with a thin layer (1/2 3/4&quot thick). After that, use a metallic scraper or small scrap of lath to rake horizontal groves in the scratch coat. Give the scratch coat some time to set up/cure. You are then supposed to follow the procedures explained below. Prepare a rich mortar (2:1 washed sand: Portland cement). Mix it for a minimum of five times into a creamy nature similar to that of mashed potatoes. Make a decision on whether the stones require trimming, or they will get layered on the surface as they are. Wash off dirt, loose particles and sand from the working surface. At times, it is better if you wash the stones too. In cases where the surface is dry, dampen with the help of a masonry brush taking care not to make the place soggy. By doing so, you will prevent the wall from absorbing moisture from the mortar. Hence, the mortar sets up naturally with a strident bond. To avoid messy work, start from the top moving towards the bottom of the wall. Trowel rich mortar onto the wall (approximately 1/2 thick). Take a clean stone and dampen the backside. It reduces the amount of dust of the stone and consequently reduces absorption from the mortar. 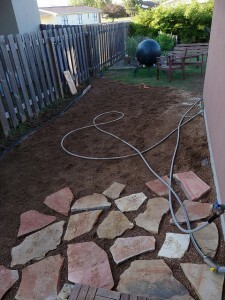 Apply a thin coat of rich mortar on the backside of the stones picked. It fills in holes and rises in the stone making an even surface that bond better with the wall. Press the stone onto the mortar with slight rotations. Some mortar squeezes out freely in the process. Remove any of the mortar that gets forced out beyond the finished joint with a trowel, brush or joint tool, before the mortar sets up. Use grout bag/trowels to fill all the joints. As the mortar hardens, tool desired depths and wipe of any excesses. Finally, clean and seal all joints. Visit us on Houzz for more home Thin Stone Veneer projects. You can also see our listing on Mantra.